Beautiful pictures and beautiful roses! My third child was born on St. Patrick's day and I named him Michael Patrick, Michael after my dad and Patrick because he was born on that day. He is 35 now and lives in Anapolis, MD. also a psychology teacher! I do enjoy your blog and always click on when I see you post. You really went all out today with your post. Featured so many others. I do good to get one in. 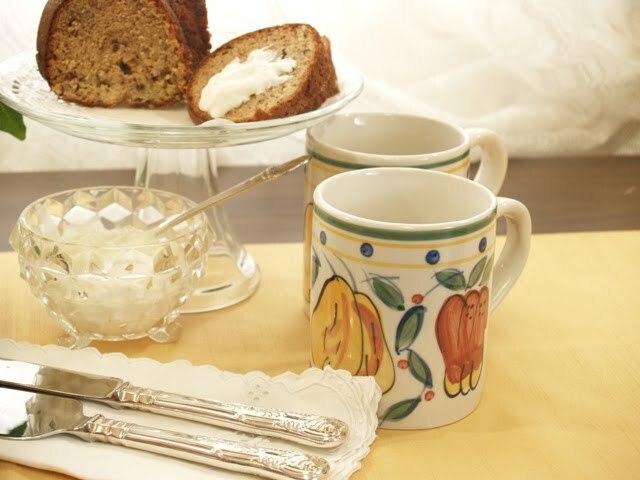 I love your teapot and banana bread is one of my favorites. That is a very pretty rose. What great vintage goodies!! And now, I am hungry...for something sweet!!! Have a great VTT! Beautiful flowers and a lovely tea setting! Oh my goodness! I just made banana bread the other day and it never occurred to me to put it in the bunt pan! FABULOUS IDEA! Especially for a gift! Thank you so much for the clever idea! Beautiful photos too! How cheery! I did a yellow post, too. I wonder, now, is that your favorite color? Mine is lavender but it goes beautifully with butter color.=] It's so funny but, suddenly, this lovely color is everywhere.... happy us! I like your tea pot, too! It's not the "same ol' same ol'". Very pretty! And, then, here it is - 1:44 in the morning and I've been working on a mosaic, too. Mercy, mercy! Too much fun! Gorgeous roses! Your banana bread looks so good. And I like the teapot; it's so cute. Beautiful photo mosaic. Love this...and the yellow roses...you can't beat flowers. Anytime, anywhere. And banana bread? Whoa baby, am I there at your doorstep? Yes, indeed! What lovely roses and I think that that is the same recipe I use for banana bread, which is my favorite!! The roses are just soooo gorgeous!!!!!!! Such vivid, perfectly timeless roses! PS Your mosaic all together is wonderful as welL! What gorgeous roses! And that banana bread looks divine- I'd love to come for tea at your house! Happy VTT and thanks for sharing today! Gasp - that tea pot is drop dead gorgeous!!!! Is your friend still in business? Your yellow vignette looks utterly charming! 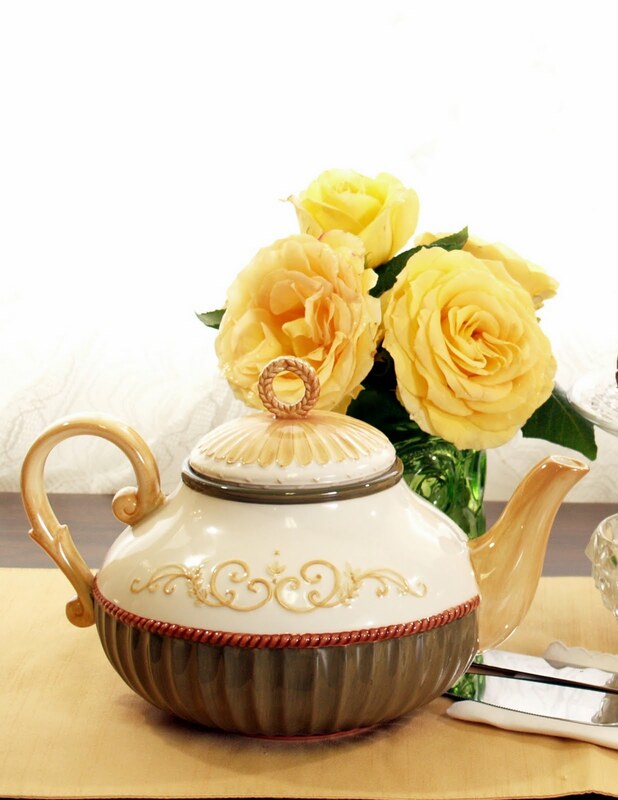 The roses are gorgeous and so is your teapot!! Gorgeous roses and what a sweet story to go with them. Lovely post. Oh! 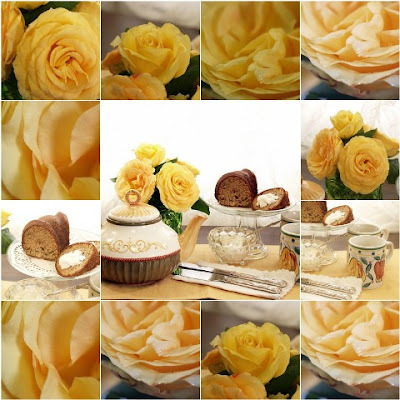 Your yellow roses are stunning and the bread looks so delicious...with cream! Happy Birthday to your son. I tell my oldest son, his birthday is harder on me than my own...can't believe I have a 36 year old! Sooooo PRETTY...luv those yellow roses! What a beautiful full yellow rose. I've never heard of this particular variety, but its a gorgeous one. Beautiful post. Click here to visit my post. Really beautiful mosaic...hope u get a chance to visit My Dream Canvas too!! I love banana bread infact I just back some last few days.. and your bread looks yummy.. and the roses devine! Beautiful still life mosaic!!! You should be a painter with that setup!!! I'm so happy you found me! You have a scrumptious post, from the stunning yellow roses to the lovely tea pot! That banana bread looks delish. I love banana bread myself! Thank you for stopping by and joining me for Tea Time. I am happy to sign up as a follower. Wishing you a delightful week. Oh, I love banana bread so much! The cake plate is lovely! I adore the teapot! The servers! The cups! Just a wonderful Tea with the yellow roses! Thank you for joining me for Tea Time Tuesday. Your Tea is lovely! 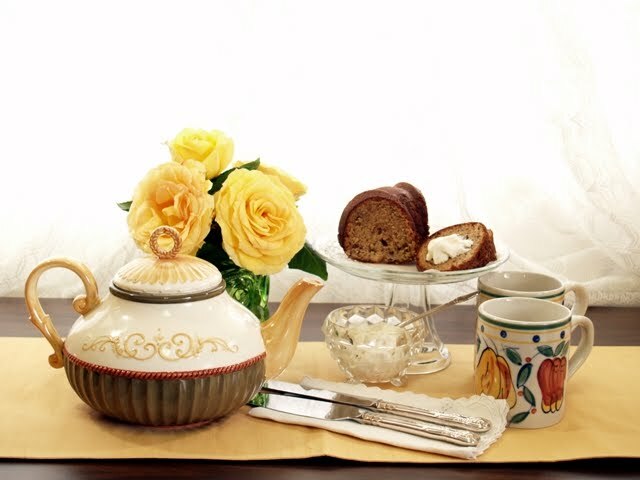 Delicious both roses and banana bread!Loved the tea party!Thank you for sharing!I will try your recipe! You have done a wonderful tablescape and mosiac. It all looks so pretty and the cake delicious. Those are beautiful roses but the Banana Bread is what has my full attention:) I can almost taste it and you made such a lovely setting for it.. Your tabletop vignette is just gorgeous! 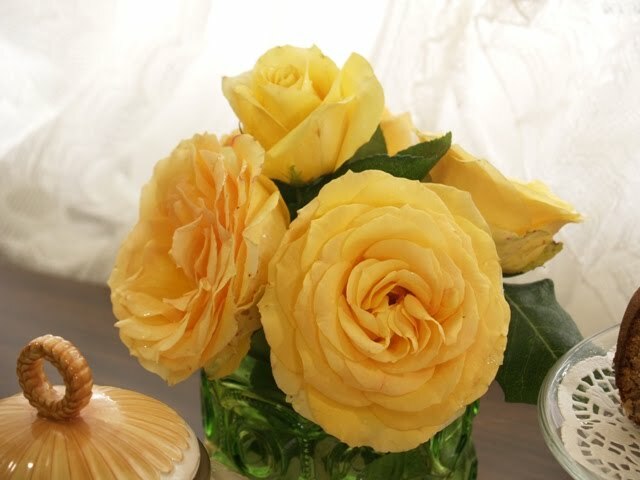 I adore the yellow roses. Your roses are breathtakingly gorgeous ... as is your mosaic. My fav banana bread w/whip cream, yum! & a pot of black tea ... awww! Beautiful presentation!! I'm here to join you for tea and I just love your teapot and the banana cake looks yummy. I find having a plant named for a family member or special friend makes it that much more of a treasure. What a sweet post and YUMMY bread...I just made Amish bread to share today and mine had banana's in it too!